Insider: Tudor Heritage Black Bay Midnight Blue ref. 79220B. Way Better Under Natural Light. 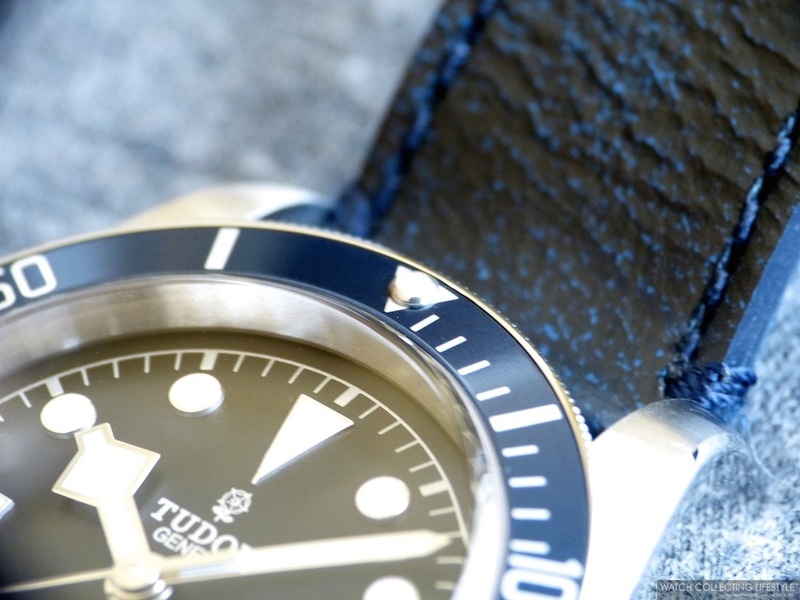 While the Tudor Heritage Black Bay ref. 79220R with red burgundy bezel insert and gilt dial was launched at Baselworld 2012 —reviewed here—, it wasn't until September 12, 2013 that the brand relaunched in the U.S. and the watch became readily available at very few select authorized dealers that Tudor cherry picked. For many watchlifestylers, the Tudor Heritage Black Bay was some sort of fad during 2012 and the watch has been up and down in popularity since then. Two years later, Tudor presents a new iteration of this fascinating timepiece with a non-gilt dial and a midnight blue bezel that we are featuring here. The Tudor Heritage Black Bay Midnight Blue also honors the first Tudor Sub from 1954 in a perfectly sized 41mm case with a great vintage feel to it and mesmerizing snowflake hands. Just like on the first Heritage Black Bay, the watch is available on stainless steel bracelet or on a distressed leather strap. Both options also offer an additional interchangeable nylon NATO strap that is pretty neat. In the case of the Midnight Blue, the leather strap is dark blue as well as the nylon strap provided with the watch. While we've seen the advertising campaign with the new Tudor Heritage Black Bay Midnight Blue almost everywhere, we feel that the stock images don't do fair justice to this amazing timepiece. While stock images depict the bezel insert as being lighter than what it is, is not until you see the watch in person that you realize that the bezel is really darker and at times almost black looking depending on the lighting conditions. 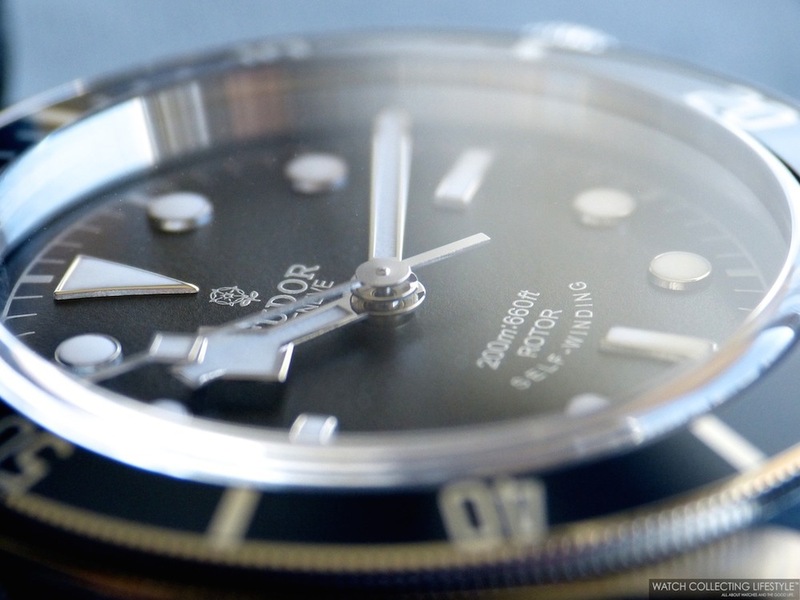 Here at WatchCollectingLifestyle, we bring you these macro photos under natural light that depict the watch as close as possible to what your naked eye will perceive if you were admiring the watch outside the bright lights of the authorized dealers. Now, please enjoy the rest of these macro photos—under natural light— we have prepared for you and get ready to go get one as soon as you're done. We really know you will once you get hypnotized by those amazing chamfers, that matte dial, its snowflake hands and the bright glowing and long lasting luminova on its markers and hands. Now, for those of you still indecisive whether you should go Midnight Blue or Burgundy, don't worry, we got you covered. Below you will find a side-by-side shot of both watches together as well as wristshots of each of them in order to make it easier on you. While we feel the new Tudor Heritage Black Bay Midnight Blue is a perfect year-round watch, we think the Burgundy model is more suited for Fall and Winter. While we absolutely love the new model and any watch with blue accents or blue dials, we still prefer the previous iteration with its gilt dial and burgundy bezel. But again, that's just us and the final decision comes down to you. Sticker Price $3,425 USD on stainless steel bracelet and $3,100 USD on aged leather strap. For more info on Tudor Watch click here. Posted on July 22, 2014 by Editor & Publisher and filed under Tudor and tagged Tudor Heritage Black Bay Midnight Blue Tudor Black Bay ref. 79220B Top Brands.